Japanese developers Nippon Ichi have cultivated a loyal following over the past few years by releasing some of the most innovative RPGs on the current generation of consoles. These include Disagea: Hour of Darkness, Phantom Brave and LaPucelle Tactics. All received glowing praise from fans and critics alike. 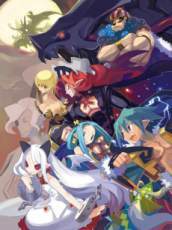 Now, the developers are working on another promising title, Makai Kingdom for the PS2. This game mixes traditional RPG gameplay with strategic and building elements to create a unique and interesting title. Their trademark sense of humor and off-beat play mechanics should be very much in evidence here as well, with odd character designs and wild special attacks that should make for an engaging title. Makai Kingdom is set in an alternate universe called the Netherworld. Players take the role of the displaced Lord Zetta, who's been deposed from his throne and is fighting to regain control of his land. The game's unusual play mechanics and unique visual designs make it immediately apparent that this isn't going to be another cookie-cutter RPG. Makai Kingdom mixes genres, styles and eras to create an interesting hybrid of both strategic and role-playing elements. Players will be able to choose their characters, construct many different object types or facilities and then use them against rival factions as the battle for supremacy. The game places you in control of Lord Zetta, who cares only for his own survival and will use the other characters in the game as his pawns. As the game begins, Zetta only has a small shack as his headquarters, and must summon or invite other characters to join him in his mission. At first, the types of objects and characters you can create are limited, but additional types of facilities and characters will become available later on. Makai Kingdom's building aspects sound interesting since the game allows you to construct various items such as libraries, hospitals, storage buildings and even dog houses to build your kingdom. When you have built these facilities, you can then store characters, weapons and other items in them. However there's a catch: in order to build certain buildings, you'll have to sacrifice some of your onscreen characters. When the characters are confined to an object, they cannot return to their original spirit state, but they will retain some of their other skill points. Creating characters and sending them into battle requires you to complete several steps. The first thing you need to do is to select an object such as a tree or stone, and carry it to Zetta's tome. Once you've done this, you need to talk to the tome and create the character. At this point, you need to decide what type of character you want to create. After you have done this, the object will transform into a unit. Once they've been created, players can then "Invite" them onto the battlefield. After you have created your character, you'll need to confine or store it in a facility, where you can use the Dispatch command to send them into battle against the assembled enemy forces. However, players will need to be careful where they place these facilities, since this will make a huge impact as to the success or failure of your campaigns. This somewhat complicated character system allows players to create many types of objects and characters throughout the game. This flexibility should enhance Makai Kingdom's replay value significantly, while making for a unique experience. Its clever character creation and facilities systems definitely give Makai Kingdom's gameplay a unique feel. Players will also have access to a variety of unique weaponry ranging from modern weaponry such as rocket launchers, to ancient tools like a traditional broadsword. Players will also be able to use a variety of vehicles, such as tanks, motorcycles and, mech suits to traverse the kingdom faster. The additional firepower of these vehicles will also make for a more enjoyable title. The gameplay in Makai Kingdom will offer a mixture of traditional turn-based role-playing with a more action packed approach where the battles take place on a grid-free map. The gameplay will be more varied than most linear RPG's thanks to the 'random extension' battle maps. What this means is that the levels will be randomly generated each time you play with different maps, terrain, objects, enemy types and levels will change every time you play. This can extend to stages you just played. This should expand Makai Kingdom's replay value substantially, making for a less predictable, more exciting game. While the individual battles sound impressive, you shouldn't leave sight of the main main goal which is to defeat the enemy kingdoms and reclaim Lord Zetta's rightful place on the throne. However, players will need to take caution because the rival Lords will also attack you, with their own facilities, which they can summon or place in your kingdom. When these enemies invade on of your facilities, the battle will move inside its walls, and if the invaders are successful, they can steal any items you've placed inside the building. This will definitely add to the challenge and fun of the game, creating all-out battles that should increase Makai Kingdom's intensity to frenetic levels. Along the way, Lord Zetta will meet several other characters including the oracle Pram, who predicted the fall of the Lord, and the subsequent destruction of the Netherworld. He'll also run across the Dark Lord Valvoga, who appears at several points during the game as an end boss. This monster is actually made up of three different rival overlords, making him a powerful foe. Finally, players will encounter Lord Zetta's archrival, Alexander, who has sent assassins to kill Lord Zetta many times and has failed. Obviously, he's not the smartest god in the universe. This weird sense of humor is one of the key to the appeal of Nippon Ichi's earlier titles were. Makai Kingdoms continues this approach with its offbeat design and humorous plotlines. Makai Kingdom's interface and control scheme should be familiar to RPG elements and the game's overall approach should make it easy to play. The action takes place in a traditional angled, top-down perspective that allows players to see the majority of the relevant game screen unhindered by objects. Makai Kingdom then switches perspectives when the action sequences unfold, giving the game a dynamic, exciting presentation. Overall, the game looks to achieve an interesting and clever look with creative character designs and an off-beat sense of humor that should appeal to role-playing fans. Makai Kingdom has many interesting elements going for it that should make it a hit with gamers. It's unique gameplay blends several elements from other genres including building, role-playing, strategic combat and action to give it a unique feel. Its randomized levels should keep the gameplay unpredictable and challenging, while extending the title's longevity. The developers' trademark sense of off-beat humor and design seems intact once again, making this one that should make for an entertaining title, without being too strange. The accessible controls, and action packed gameplay means this should offer a lot of challenging gameplay without being overly difficult. Makai Kingdom is another RPG from Nippon Ichi and Atlus and one that looks set to please the developer's devoted fan base.